LeBron James described More Than a Game and Shooting Stars as being separate projects during a recent interview on Late Show with David Letterman, and while they may have been conceived independently, each is best viewed as supplementary to the other. Individually, each is successful and self-contained in its own right; one doesn't necessarily need to partake in both to have a wholly fulfilling experience. But as with any film-book pair that covers roughly the same area, prose on the printed page allows for more detailed expounding on events and ideas presented in its screen counterpart: for example, the controversial past and rough reputation of St. Vincent-St. Mary's head basketball coach during James and his teammates' freshman and sophomore years, Keith Dambrot, is more fully illuminated; one more memorable gametime moments in the film centering on "Little" Dru Joyce III is fleshed out in its own chapter. 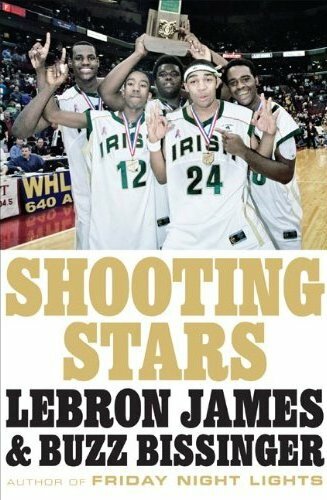 That last point shows how James and collaborator Buzz Bissinger have in Shooting Stars adopted the same egalitarian approach Kristopher Belman employed for More Than a Game; while told in James's voice, as reflected in its title, the book is indeed about the entire collective of the "Fab Five" (James, Joyce III, Sian Cotton, Willie McGee, and Romeo Travis) and Coach Dru Joyce II, going into extensive background on their individual stories. Make no mistake, though, that this is, per the byline, the whole story as told from James's distinct perspective, and so there is quite a bit more added insight--and personal opinion--on the various scandals and controversies that erupted with him following his sudden post-Sports Illustrated celebrity in junior year. Despite the added the added heft and depth, Shooting Stars is a brisk read much like how More Than a Game is a brisk watch: entertaining and engaging as it breezes by before you, but the power and poignance of its stories linger for long after.